The opening of Oceania sees 500 years of Pacific art take centre-stage at the Royal Academy in London. With six objects from our collection featuring in the exhibition, Collection Manager Shane James provides a glimpse into how some of the Pacific’s most revered taonga made their way to London. I always tell people that exhibitions are such good value for money. The work that goes on behind the scenes is extraordinary, especially when international institutions borrow from one another. In the case of Oceania, the loan process for us began almost two years ago. Long before collection managers were involved, our Loans & Acquisitions Advisor Amy Cosgrove acted as our key facilitator with the Royal Academy, ensuring both parties were always on the same page. As the collection manager, the first thing I do once any loan is approved is provide access to our specialists. 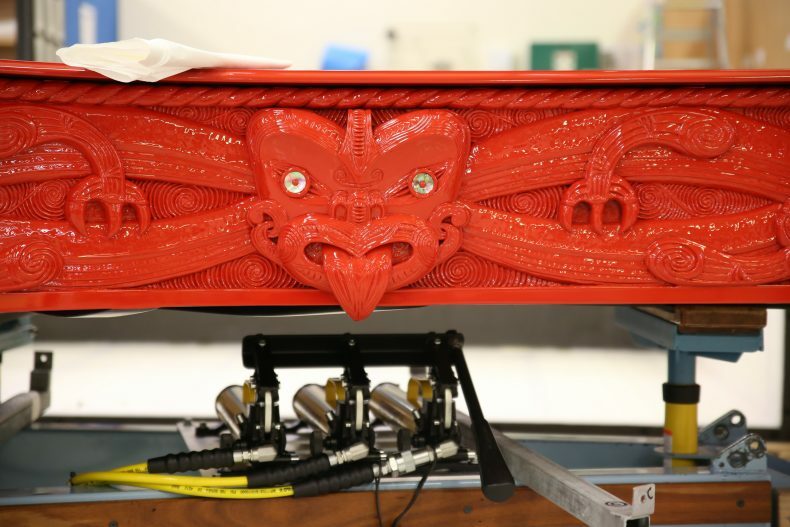 This includes curators, mount makers, crate makers, conservators, and those who manage iwi relationships. This project team has so many things to consider, from obtaining the cost of freighting, to consulting the relevant iwi, to thinking about how taonga will be displayed securely at the destination. Conservator Anne Peranteau completed conservation treatment on a fragile pennant flag so that it would be adequately supported while on display. This included hand-stitching a layer of custom-dyed sheer net over part of the surface. For transit, she designed bespoke duvets for the textiles, which were produced by object support preparator Sam Gatley. 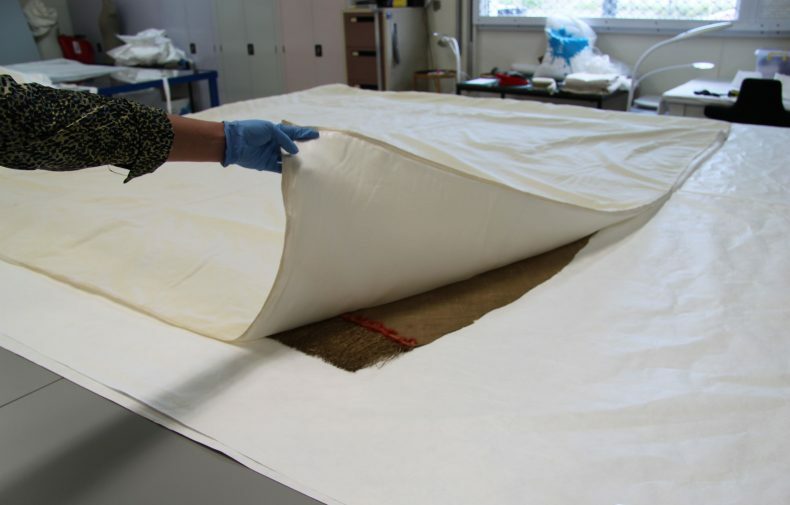 The pennant flag and ‘ie tōga were rolled with these silk-lined duvets to lessen the risk of damage during transit and also to aid safe handling during the install process. The crating team had to make a range of new crates and the international crate for the He Korero Purakau mo Te Awanui o Te Motu: story of a New Zealand river was reworked. This increased protection and simplified the crating and un-crating process for what is a very heavy sculpture. Before the crates were loaded onto the truck destined for Auckland Airport, karakia (prayers) were performed by Rongowhakaata Pou Tikanga. While my colleague Mark Sykes accompanied our precious cargo on the truck, I prepared for the 60-hour second leg of the journey on board an international freight plane. Unlike a regular passenger aircraft, these things carry all kinds of things – on this occasion, there was even a pair of equestrian horses! Prior to take off, I had this amazing team to share the load with. But with overseas loans like this one, you become a lot of things to a lot of people. All of a sudden I was collection manager, courier, installer, problem solver, and cultural ambassador. 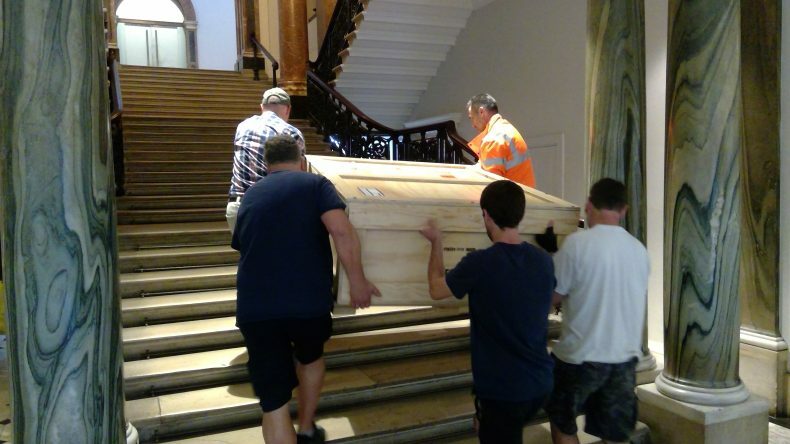 Before I started un-crating and installing, I told Royal Academy staff that we would start with a karakia. This would acknowledge that we were working with treasures that had both a physical and spiritual element to them. It’s also a form of protection which enables us to safely work with these treasures. Taonga are seen as the living embodiment of our ancestors and not just as objects. I began by playing my pūtātara. This was especially important given the exhibition’s purpose. This would have been the sound that Captain Cook heard when he first arrived on the shores of Aotearoa 250 years ago. This was the first time a lot of the staff at the Royal Academy had experienced a ceremony which paid homage to the spiritual elements of artworks. 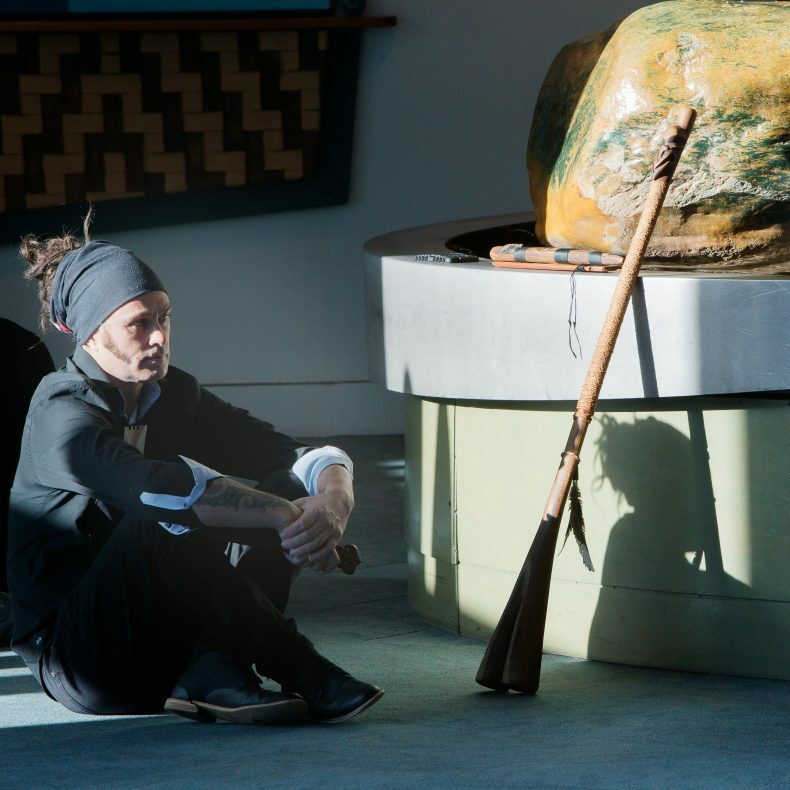 In a very real way, we as kaitiaki (guardians) can share the cultural uniqueness of our country and acknowledge our bicultural journey. I find loans overseas an incredible opportunity to share our love for art and culture. It’s a chance to celebrate our distinctions and our similarities. Oceania reminds us of the shared connection to our past and to a land that was once so very far away. Isn’t it great that we’re now only separated by a 36-hour flight – if you’re not aboard a freight plane that is. Entry to the exhibition is free for New Zealand and Pacific Island passport holders. Excellent, Shane: would love to have heard the ceremony you performed on pūkāea. Maaori custodians are luckier than Rapanui ones. The Maaori custodians only are loaning their taonga; Rapanui have two taonga imprisoned in London: two moai. One has been on permanent display in the British Museum since 1869 and the other, moved to the Royal Academy, mostly has been stored the the BM’s warehouse since then. There is little chance that either will be returned any time soon to Rapanui, Tepitootehenua, any time soon, in spite of repeated requests. Kia ora Shane, thanks for my mention! Such important mahi going on at Te Papa to share these taonga with the world. Glad the trip went well!